Golden is the Home Rule Municipality that is the county seat of Jefferson County, Colorado, United States. Golden lies along Clear Creek at the base of the Front Range of the Rocky Mountains. Founded during the Pike's Peak Gold Rush on 16 June 1859, the mining camp was originally named Golden City in honor of Thomas L. Golden. 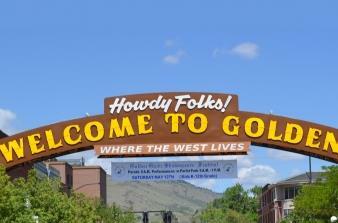 Golden City served as the capital of the provisional Territory of Jefferson from 1860 to 1861, and capital of the official Territory of Colorado from 1862 to 1867. In 1867, the territorial capital was moved about 12 miles (19km) east to Denver City. The United States Census Bureau estimates that the city population was 18,867 in 2010. The Colorado School of Mines, offering programs in engineering and science, is located in Golden. Also there are the National Renewable Energy Laboratory, National Earthquake Information Center, Coors Brewing Company, CoorsTek, Spyderco, American Mountaineering Center, and Colorado Railroad Museum. It is the birthplace of the Jolly Rancher, a candy bought out by the Hershey Foods Corporation. Famous western showman William F. "Buffalo Bill" Cody is buried nearby on Lookout Mountain.